WASHINGTON — The United States, United Kingdom and Norway have agreed in principal to create a trilateral coalition built around the P-8 maritime aircraft — though exactly what that means remains unclear. A defense official, speaking on background, told Defense News that nothing is “set in stone,” and this is just a first step toward coordinating around the aircraft. Potential areas of cooperation include joint operations in the North Atlantic, information sharing and the possibility of co-locating maintenance and training assets. The last point would seem to build on a November pledge between the U.K. and Norway to find ways to jointly drive down costs for the maritime surveillance plane. The U.K. plans on buying nine P-8s, while Norway has agreed to purchase five of the Boeing-made planes. "The pounds-to-dollar exchange rate is particularly important for the British Ministry of Defence, which has agreed to buy high-dollar value items such as Lockheed Martin’s F-35 Joint Strike Fighter, Boeing’s P-8 maritime surveillance aircraft and General Atomics’ MQ-9 UAV, among others. Some analysts have warned that the U.K. could be overcommitted to the tune of £20 billion (U.S. $25.8 billion) over the next 10 years unless the MoD can deliver large efficiency savings." "At the same time, the secretary acknowledged that decisions made in the 2015 Strategic Security and Defence Review, or SSDR, need to be assessed with the post-Brexit world in mind." "Britain is being forced to pour millions of pounds of new funds into the troubled F-35 stealth fighter programme being developed in America and considered a vital part of the UK’s future defences. [...] But huge problems remain unresolved, in particular with the F-35’s advanced software, on which the whole project rests. The software is supposed to be the plane’s “brain”, running everything from ensuring a steady supply of parts to relaying masses of data to the pilot’s visor during combat." "The British government has refused to publish an estimate of the overall cost of the 138 F-35s it is to buy, as well as its contribution to development costs, but the figure will run into the tens of billions." Meanwhile the F-35 leashold subscription program is getting a $5.6B prepayment to start working on LRIP 11, although the contract is not finalized. @BMD F-35A for RAF? Or RN now realises F-35C was way to go ? As suspected for a long time it will be F-35As and F-35Bs. F-35Cs are out because the QEs can't operate them and they're inferior to As from land. As will have a few niche weapons that the Bs can't carry like JSM and AARGM-ER. Good Tornado replacement. Agent_47 and BMD like this. Gessler, Hellfire and BMD like this. One of the more common myths busted. One of the most common myths around the system is that the United States has control over the UK’s Trident missile system, that is not the case. The Trident missile system is housed on the UK’s four Vanguard class submarines which form the UK’s strategic nuclear missile force. Each of the four boats are armed with up to 16 Trident II D5 SLBMs, carrying up to 8 warheads each. The Royal Navy has operated the UK’s Continuous at Sea Deterrent since 1967 when the first SSBN – or Ship Submersible Ballistic Nuclear – HMS Resolution began patrolling armed with the Polaris missile system. In 1996 HMS Vanguard, the first submarine armed with the Trident missile system, arrived on the Clyde and took over deterrent patrol duties from the Resolution Class. The four Vanguard-class submarines form the UK’s strategic nuclear deterrent force. It’s often said that the UK’s Trident nuclear weapons system is not ‘independent’ or that the UK doesn’t have the ability to use the system without the US agreeing to it, in reality the UK does retain full operational control over the system. One common argument is that the US can simply ‘turn off’ the GPS system and therefore can stop the UK using Trident, this is also a myth, Trident isn’t guided by satellite. One source for the confusion could be the fact that, aside from those currently deployed, the missiles are held in a communal pool at the US Strategic Weapons facility at King’s Bay, Georgia, USA where maintenance and in-service support of the missiles is undertaken at periodic intervals. The missiles are jointly maintained, this is much cheaper than the UK doing it on its own and does not give the United States control over any of the weapons deployed on the submarines. The British missiles are controlled through the Royal Navy chain of command all the way up to the Prime Minister. In reality the Prime Minister would make the launch decision in concert with whatever was left of the British government. The key point here is that the British deterrent does not have permissive action link control, which means it does not rely on the use of codes to fire the system. The UK’s Trident fleet relies purely on military discipline to prevent a launch. In summary, the UK retains full operational control, to the extent that the US could not stop the UK from using the system. A Freedom of Information request proving that the United Kingdom has full operational control over its Trident missile system can be downloaded here. Abingdonboy, BMD, Gessler and 1 other person like this. 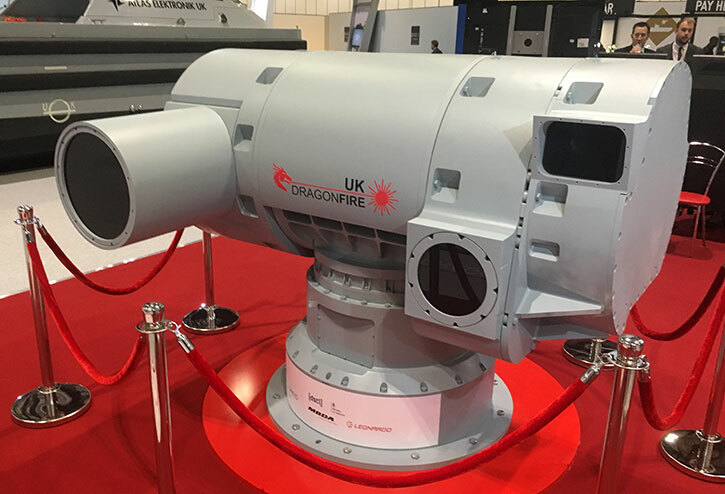 A new laser weapon demonstrator being built for the UK Ministry of Defence has been unveiled today by the UK Dragonfire consortium at DSEI 2017 in London. 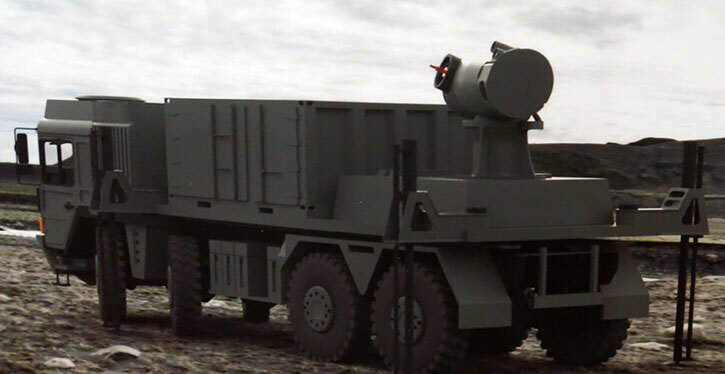 Known as the Laser Directed Energy Weapon (LDEW) Capability Demonstrator Programme (CDP), the effort will see UK Dragonfire trial this new sovereign capability in the maritime and land domains in 2019. The Dragonfire laser effector is designed to operate offensively or defensively. A full-scale model of the system was displayed at DSEI 2017. A key benefit of the Dragonfire LDEW technology is that the base system is highly adaptable and its effects are scaleable. As such it offers a range of different engagement solutions depending on the tactical scenario, these include tracking, deterring, dazzling the sensors of a potential threat, up to damaging or destroying it. The laser developed by QinetiQ employs a scalable, coherent beam combining technology to create laser source with a power level of ‘several tens of kilowatts’. The system will be scalable to higher power levels, as required. The coherently combined fibre laser technology developed by QinetiQ associates phase control system that provides a high precision laser source that can be effectively directed at dynamic targets and achieve high power density on target in the presence of turbulence. Beam combining is a technology that is able to achieve enhanced power densities at target, reducing defeat times and increasing engagement range. Therefore, although the system is not of a ‘100 kW’, power level which is considered for weapon grade lasers, the Dragonfire beam director designed by Leonardo optimises the laser beam to optimize to atmospheric conditions that otherwise would dissipate much of the energy. 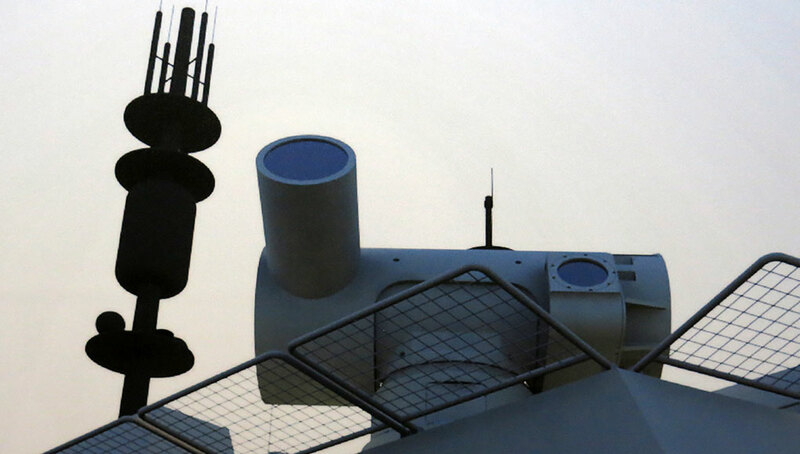 Among the uses of LDEW systems are providing very short-range air defense capability, close-in protection for naval vessels, counter-unmanned aerial vehicle (UAV), and protecting friendly forces from mortar and artillery attack. The consortium developing the UK Dragonfire, led by MBDA, under contract to the Defence Science and Technology Laboratory (Dstl), the project brought together Britain’s leading specialists in laser, EO and electronics, to develop a future laser-based technology for the UK Armed Forces. At DSEI the team showed the beam director developed for the laser weapon trials. The beam director is an optical system integrated into a turret. The system, developed by Leonardo, integrates QinetiQ’s powerful laser emitter, as well as world-class electro-optics for target identification and tracking. MBDA is the prime contractor and also delivered command and control (C2) and image processing for the system. UK Dragonfire was awarded a GBP30 million contract for the LDW CDP in early 2017 after a rigorous competitive evaluation. The team capitalizes on the strengths of all the companies involved, including Leonardo, QinetiQ, MBDA, Arke, BAE Systems, Marshall and GKN. A cyber security accelerator with links to the UK's GCHQ intelligence agency is doubling down for a second program that's larger and longer than the inaugural bootcamp which kicked off in January. The second cohort, announced today, will go through a nine month program vs three. There's also more of them: Nine startups vs seven. And more cash on the table for selected teams, with £25,000 apiece vs the original £5k grant. Startups in the first cohort were not required to give up any equity to participate, with neither GCHQ nor Wayra investing at that point. We've asked whether that situation has changed for the second batch of teams now that the program has been expanded and will update this story with any response. The nine startups selected for the program play in a wide range of areas, from age verification online, to security skills, to blockchain cybercrime to IoT (in)security. "£10 million out of the £155 million is available in this financial year to the Defence Innovation Fund, to support innovative procurement across Defence. The Fund is harnessing the best ideas from inside and outside of Defence through activities such as themed competitions and the Open Call for Innovation, delivered using the Defence and Security Accelerator," said Harriett Baldwin, responding to the parliamentary question. "The government also allocated £10 million to establish a Cyber Innovation Fund. This supports the UK's national security requirements by providing innovative start-ups with financial and procurement support," she added. Active protection is a new area of interest for the British Army. During DSEI The Leonardogroup announced it was selected by the MOD, to demonstrate APS technologies to counter evolving threats. As already reported here, Leonardo is also providing Israeli Trophy APSs to equip a full brigade of M-1A2 SEP2 Abrams tanks to be positioned in Europe.